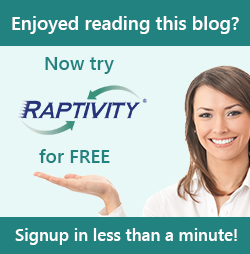 Raptivity - Rapid Interactivity Building Tool: Let’s Play a Game! Gartner predicted more than 70 percent of Forbes’ Global 2,000 companieswill use this by 2014, primarily in the areas of recruitment, learning and career development, and health and wellness. As I explained in an earlier blog, http://blog.raptivity.com/2013/03/make-it-a-game/, adding a game to your training adds a challenge which the user must overcome, keeping the user motivated.I just gave you an example of Gamification. I wanted you to learn the definition of Gamification and some facts about it. Instead of giving you dry facts, however, I turned this information into a game. Gamification is a powerful tool to engage learners, whether customers or employees, to change behaviors, develop skills or drive innovation. When a course is “gamified” correctly, itnot only improves user engagement but also lowers cost, and makes implementation easier. If you are interested in using Gamificationin your training, check them out. A number of years ago, I was working on a training project for a large, energy company in the San Francisco Bay area. There, I continued to hear about this fantastic instructional designer. Everyone wanted her on their project, and she had projects lined up years in advance. Who was she? Why was she so fantastic? As it turned out, I was invited to one of her company-wide learning experiences (class or course would just be too mundane for the likes of her). What she did was create a game show (it was something like Jeopardy) where teams dressed up (she brought in colored paper hats and beads) and competed against one another. The topic was Data Privacy Day, which, even now, I can remember happens every January 28th. What we learned was how to secure our online data, so we could keep our personal data private. It was fun and informative, and no one would want to miss it. This infamous instructional designer set herself apart not just by using games in a learning experience, but making the entire experience a game. The answer is a resounding, yes! With the advent of training tools, such as, Raptivity, you can easily turn a learning experience into a game. Raptivity is distinctive in that the games are already designed for you! Add the content for your learning experience into the game. Test the game—trinkets, such as, company pens and key chains, are always good incentives to attract testers. If you have a favorite game you’d like to tell us about in Raptivity or elsewhere, respond to this post.